Is failure a topic we want to learn about? I think it is. Failure gets a bad rap. I don’t think failure is given the positive attention it deserves. Hopefully by the end of this article, you will feel compelled to shine a light on your own failure to motivate confident action. First, let me continue my story from last entry. In grade eight I learned a great deal from Ben Wicks about cartooning but I didn’t take action right away. Jump forward to 2003 and I was exhibiting my artwork in galleries across southern Ontario. Soon after, I was also attending a graphic arts degree program. My hand-made, one-of-a-kind book and its wooden case. This was the precursor to my first published book. 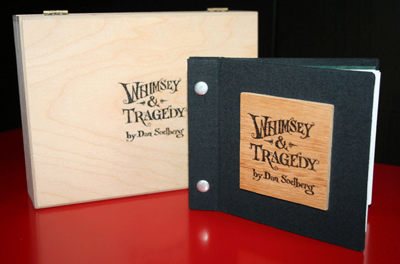 For one of my classes I created a hand-made illustrated book of macabre poems that I called “Whimsey & Tragedy”. You can see a video of a poem from this book here. 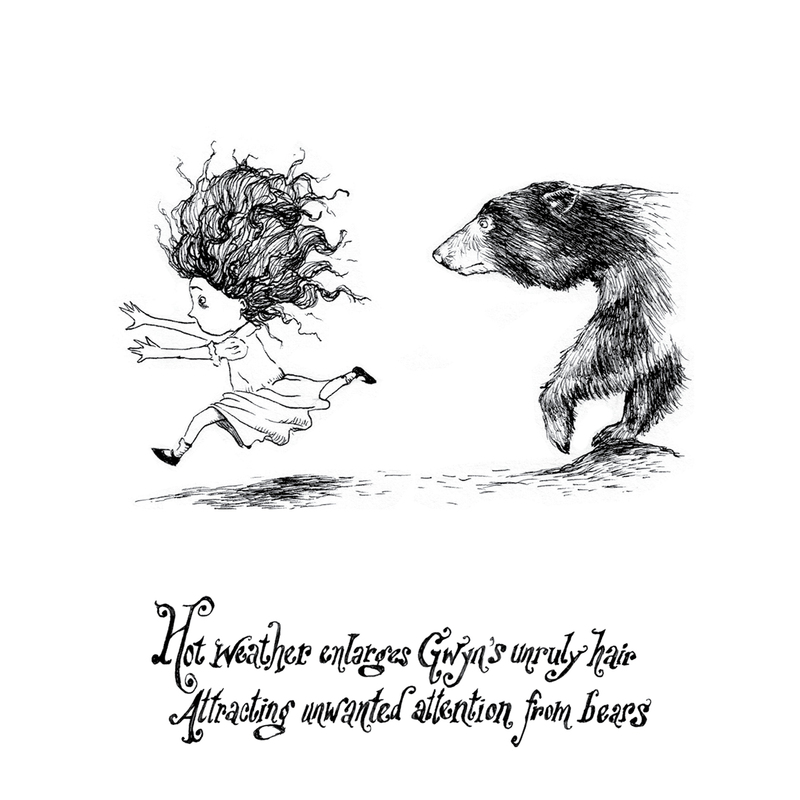 By late 2007, my artwork was evolving and I was developing ideas for spot illustrations that had accompanying rhyming couplets. I really liked where this was going but I wasn’t sure if this fit into my gallery exhibitions. In 2008, I had the idea to make these illustrations into a series of cartoons that I would sell to a cartoon syndicate. In case you don’t know, syndicates distribute cartoons to publications worldwide and represent all the successful cartoonists who earn a living from their cartoons. I’ve been an active writer (writing a column for my local newspaper for a couple of years) and graphic designer since early high school so it seemed like I had all the skills and tools to pull this off. It felt right. This is when Ben Wicks’ voice started up in my head. His advice flooded my thoughts, and I realized that this was the time to give it a go. There was one thing I screwed up in a huge way though. Huge. For financial reasons, Ben told me explicitly to marry a nurse. I did not. I didn’t just not marry a nurse, I married another creative person. I had been married to Jaime for four years. I told Jaime about Ben’s advice and we both realized what a dumb, dumb thing we’d done. On the plus side, we were madly in love, we both had decent jobs in graphic design and we owned a house, so we weren’t complete idiots. All the cartoons I was making meant that I had little time to create artwork for gallery exhibitions, so they dwindled down to just one or two a year. “Gwyn” was the first finished cartoon. It set the tone for the rest of the series. Once I had my first twelve panels complete I started sending off to the syndicates. At this point I was firing shots in the dark. I had no idea how to get my cartoon from “not being published” to “being published“. #1: Rejection helps me find an audience for my creations. John Glynn’s hand-written note is honest and direct. This was the most valuable direction I received from any of the syndicates. 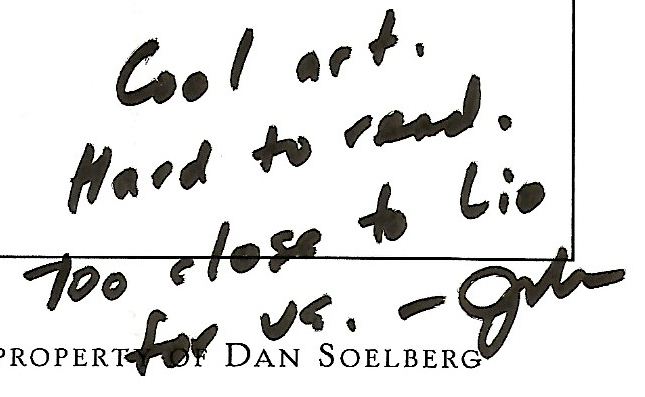 For instance, editor John Glynn at Universal Press Syndicate wrote me a marker-scrawled note, which said that my hand rendered lettering is “Hard to read”. In other words, John’s saying that his audience will find it hard to read. There are two intelligent ways to respond: I could change the text to a standard typeface and resubmit, or I could find a medium other than cartoon syndication that accepts my hand lettering. The point is, I get to decide what I will and will not change to uphold the integrity of my work, which in turn determines how my work is published and determines the audience I have access to. If I want the cartoon syndication audience, I’d better change my lettering. You can apply the same lesson to any new idea or product you propose in the business world: In the face of rejection you can decide to make the changes suggested, or you can find another application for the idea. #2: Rejection gives me insight to what is currently successful and what isn’t. If I have a cartoon that is completely different from anything that’s ever been done, chances are that nobody will hire me. It’s too risky. They want something that fits in with whatever is currently successful, but has one element that distinguishes it. However, if it’s too similar to something that’s already being published, nobody will hire me either. For example, that same rejection note from John Glynn also said “Too close to Lio”. Since I had never heard of Lio, I researched. I discovered that Lio is a macabre cartoon. I was going for macabre, so I hit my target. Unfortunately, John felt there was not enough to distinguish me from Lio. Again, you can apply this valuable lesson to any new idea or product. If someone thinks your product looks just like something that’s already on the market, you may have to do some serious retooling. Over the course of a few months I was rejected by the best: Universal Press Syndicate, Tribune Media Services, Washington Post Writers Group and Torstar Syndication Services. Actually, I submitted to Torstar twice and was rejected the same number of times. Some were just form letters but others had personalized advice and encouragement. By this point I was already planning to assemble a cohesive book and I didn’t feel much like changing anything. I liked it. But it really didn’t matter what I thought because the syndicates were unanimous in their rejection of me. So I chalked up all this rejection to a fantastic failure. I decided to give up on cartooning, at least for the time being, and move on. Sometimes giving up on a goal is the best way to focus on a new one and keep the momentum going. I was excited to make a book. I was even more excited to get feedback from the public. What would they think? I was ready to find out.